The legend of Madame Delphine Lalaurie, a wealthy society matron and accused slave torturer, has haunted New Orleans for nearly two hundred years. Her macabre tale is frequently retold, and her French Quarter mansion has been referred to as ""the most haunted house in the city"". Rumors that Lalaurie abused her slaves were already in circulation when fire broke out in the kitchen and slave quarters of her home in 1834. Bystanders intent on rescuing anyone still inside forced their way past Lalaurie and her husband into the burning service wing. Once inside, they discovered seven ""wretched negroes"" starved, chained, and mutilated. The crowd's temper quickly shifted from concern to outrage, assuming that the Lalauries had been willing to allow their slaves to perish in the flames rather than risk discovery of the horrific conditions in which they were kept. Forced to flee the city, Delphine Lalaurie's guilt went unquestioned during her lifetime, and tales of her actions have become increasingly fanciful and grotesque over the decades. Stories of perverted tortures, of burying slaves alive, of cutting off their limbs have continued to plague her legacy. A meticulous researcher of New Orleans history, Carolyn Long disentangles the threads of fact and legend that have intertwined over the decades. Was Madame Lalaurie a sadistic abuser? Mentally ill? Or merely the victim of an unfair and sensationalist press? 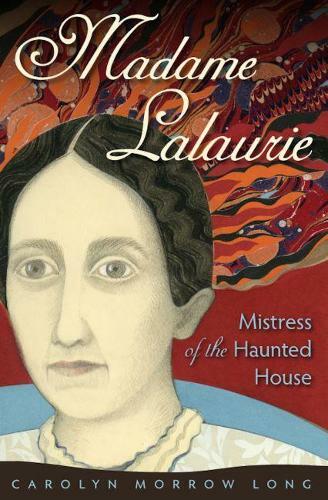 Using carefully documented eyewitness testimony, archival documents, and family letters, Long recounts Lalaurie's life from legal troubles before the fire through the scandal of her exile to France to her death in Paris in 1849. As she demonstrated in her biography of Marie Laveau A New Orleans Voudou Priestess Long's ability to tease the truth from the knots of sensationalism is uncanny. Proving once again that history is more fascinating than elaborated fiction, she opens wide the door on the legend of Madame Lalaurie's haunted house.